Ashley Bowen, PhD is guest curator of Politics of Yellow Fever in Alexander Hamilton’s America, the National Library of Medicine online exhibition and companion onsite special display that launched January 11th. Circulating Now interviewed her about work. Circulating Now: Tell us a little about yourself. Where are you from? What do you do? How did you become interested in medical history? Ashley Bowen: I’ve lived all over but went to college in Oregon before attending graduate school on the east coast (first in Washington, DC and then in Providence, RI). I came to medical history after I completed my master’s degree and while working for a large public health association in their health equity and social justice program. Although I loved supporting public health professionals and thinking about how to make change, I got very curious about the origins of America’s healthcare and public health system. I enrolled in a PhD program in American Studies because I wanted to think critically both about the history of American health and medicine as well as how that history impacts the present. After working as a guest curator at the NLM for about two years, I am now at the Science History Institute in Philadelphia as a Mellon/ACLS Public Fellow and Digital Engagement Manager. CN: There has been some popular interest in this period in American history recently, what sparked your interest in the subject of yellow fever? AB: I’d be lying if I said anything other than the hit musical Hamilton by Lin-Manuel Miranda. It’s been incredible to see people get inspired about American history and engage deeply in debates about the founders, representation, and more. One of my colleagues at the NLM, Sarah Eilers, suggested that the exhibition program consider something related to Alexander Hamilton. The musical—as fantastic as it is—just scratched the surface of Hamilton’s life. I wanted to focus on a medical crisis in the new nation’s capital that attracted the attention of Hamilton and his peers. CN: What sources did you find most informative as you conducted your research for the exhibition? AB: This is such a hard question because the NLM has an enormous number of items related to yellow fever. 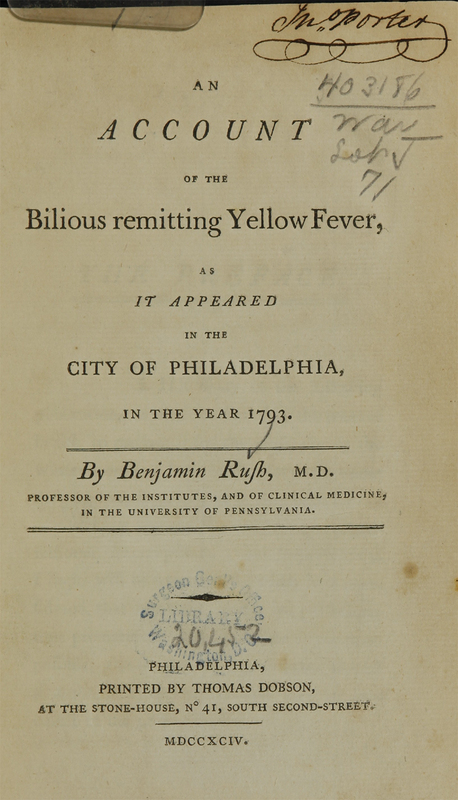 For primary sources, I frequently consulted Dr. Benjamin Rush’s book An Account of the Bilious Remitting Yellow Fever, as it Appeared in the City of Philadelphia, in the Year 1793 and the book written by Absalom Jones and Richard Allen, two African American ministers, about their relief work during the epidemic, A narrative of the Proceedings of the Black People, During the Late Awful Calamity in Philadelphia, in the Year 1793: and a Refutation of Some Censures, Thrown Upon them in Some Late Publications. The initial idea for the exhibition grew out of a classic article that historian Martin Pernick published in the William & Mary Quarterly called “Politics, Parties, and Pestilence: Epidemic Yellow Fever in Philadelphia and the Rise of the First Party System.” I also consulted classic works on yellow fever, like J. H. Powell’s Bring Out Your Dead: The Great Plague of Yellow Fever in Philadelphia in 1793 . CN: Personalities loom large in this exhibition, were you drawn to a particular individual’s story? AB: Hamilton gets all the attention these days but I’m fascinated by Dr. Benjamin Rush (one of his biographers dubbed him the “revolutionary gadfly!”). By all accounts, he was a complicated (at best) man with strong opinions, religious conviction, and a sharp tongue. He championed a number of progressive causes like abolition, prison reform, the humane treatment of people with mental illnesses, and more. He also worked as a physician but suffered substantial setbacks in his career as a result of his strongly held personal, professional, and political beliefs. CN: The traveling banner exhibition will bring this early American story to locations across the country, does that mobility inform your thinking as you develop the narrative? AB: Absolutely because on one hand, this is very much a Philadelphia story. On the other hand, the themes in the exhibition—political rivalry, social identity, disaster response, and uncertain medical treatment—are relevant to many locations and eras. I hope that people think about how the response to yellow fever in 1793 Philadelphia was, in some ways, a blueprint for how Americans would respond (or fail to respond) to later epidemics. Read more more about the exhibition in the NIH Record and NLM In Focus and explore the online adaptation. Visit the Library’s History of Medicine Division at the National Institutes of Health in Bethesda, Maryland, where the exhibition will be on display until May 22, 2019. There you’ll see historical documents on yellow fever dating from the 1793 epidemic in Philadelphia until the early 20th century, when US Army Major Walter Reed confirmed the mosquito theory of transmission (a theory originally hypothesized by Cuban physician Carlos Juan Finlay). In addition to Hamilton’s letter and the Jones and Allen book, dozens of artifacts help tell the story. Thank you for the Tour of the National Library of Medicine (NLM) on Monday, February 05, 2019, and I hope to visit again in the near future.